A previous statement was issued by 63 student associations and contained many of the same demands. According to the statement, the “totalitarian elements” did not address any of their concerns and instead retaliated against the student activists. They cited the sentencing of student rights activist Fereshteh Tousi as evidence of their claim. 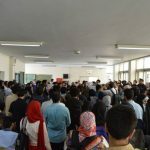 Tousi, a 30-year-old student at Allameh Tababa’i University, was sentenced to 18 months in prison for organizing a ceremony to commemorate National Student Day at her university’s campus. She was convicted of “propaganda against the state” by a court in Tehran and sentenced on July 3rd. Tousi’s sentence includes a two-year ban on leaving Iran, using social media, contributing to mass media, or belonging to a political party or association. The Iranian regime has repeatedly repressed any dissent among its people, no matter how peaceful. On July 21st, Human Rights Watch released a statement saying that regime authorities have stepped up their crackdown on peaceful student activists with harsh prison terms and restrictions. Their statement cited in eight cases similar to Tousi’s in 2018 alone. Ali Mozaffari: sentenced to eight years in prison, a two-year ban on traveling, participating in media activities, and belonging to a political party. Ali Ghadiri was given six months in prison for charges unknown. 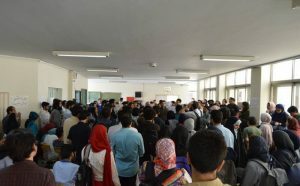 Since March of this year, more than 100 university lecturers and dozens of student associations have called upon regime President Hassan Rouhani to honor his promise to safeguard student rights. He has failed to take any action to help students, showing once again that he is not a moderate as he and his supporters claim.